My paper describing the Theory of Constructal Infonomics was presented on May 17, 2017 at the Constructal Law Conference at the Romanian Academy of Sciences in Bucharest. Subsequently it was accepted for publication in the Proceedings of the Romanian Academy of Sciences. In September, 2017, I published the paper as a book, The Theory of Constructal Infonomics on Amazon, in order to make it more available. This is a non-technical introduction to the concepts presented in the paper. Traditional biology views life as the product of DNA based evolution. Humans and their societies are studied by fields including sociology, anthropology, psychology, philosophy and more. Machines are simply designed and used, with little thought to their place in a tree of life. In his recent book, Life 3.0, Max Tegmark echos these three families, calling them stages. The Theory of Constructal of Infonomics (TCI) unites the concept of life and shows that all three of the families of life are one, governed by the same physical laws of information and thermodynamics. Life forms have the ability to use information and knowledge to direct flows of energy to themselves and amplify the energy beyond that needed for simple operation. This is the key to understanding the universal driver of life. The success of any life form is its ability to maximize the amount of energy it can direct to its own growth, evolution and reproduction. Furthermore, the TCI states that the characteristics of the simplest living organism, described below, are transitive across all levels of hierarchy and methods of operation – They are the same for DNA organisms, human social life and machines. Understanding this universal principle allows one to analyze and predict the course of future evolution as a matter of fundamental principles. As humanity gains control over DNA biology and imbues machines with ever greater intelligence, knowledge and power, new life forms may emerge that are composites of the previously separate families, but all will be governed by the same laws of nature. Today it is well accepted that biological organisms use information and are thermodynamic in operation. However, the question remained: What are the fundamental laws of nature that underpin the direction of evolution for all life forms and how do they work? As a multidisciplinary practical scientist interested in how people use and value information, this question persisted from the 1980s. In 2012, I discovered Professor Adrian Bejan’s book, Design in Nature and became aware of his 1996 statement of the Constructal Law of physics. I realized that the Constructal Law describes the critical characteristic of energy that “motivates” life to grow, evolve and reproduce. With this and gracious guidance by Professor Bejan, the present Theory of Constructal Infonomics was itself constructed. In the early 1990s, I began describing my field of endeavor as infonomics, the study of how people use and value information. It includes subjects from the physics of semiconductors to user interface design, cognitive psychology, sociology, economics and the history of information usage. In light of this new theory, I have expanded my definition of infonomics to the study of how all life forms use and value information. The Constructal Law was stated in 1996 by Professor Adrian Bejan as follows: “For a finite-size system to persist in time (to live), it must evolve in such a way that it provides easier access to the imposed currents that flow through it. As a law of nature, the Constructal Law stands on its own. Some may think the law, or its discoverer Professor Bejan, controversial, but the reality of its statement is well founded. For a law of nature to be considered a law, there can be no exceptions. However, everything has to be judged within some context. The context of the Constructal Law is macroscopic physics, not quantum mechanics or string theory. In the late 1940s, computer pioneer Alan Turing, working with others, articulated his classic conceptual proof known as the Turing Universal Machine , which proved that universal computers were indeed possible. The TCI shows that his discovery is applicable to all life forms, not just computers. Turing’s discovery was not without historical president. In the 1820s, Charles Babbage designed and partially built a mechanical computer for the British Post Office. With no knowledge of Turing’s theory, Babbage intuitively built a machine based on the same principles as modern computers. His assistant, Ada Lovelace is today revered as the world’s first computer programmer. Babbage, and even inventors from earlier times like Christiaan Huygens who invented the ball governor in the 1600s, unknowingly built machines that utilized the Turing architecture. These examples are a strong indication that Turing had discovered a fundamental principle of nature, rather than merely inventing a clever new machine. His architecture has been proven inductively thousands of times in everything from our familiar modern computers to cellular automata (Wolfram Research) and DNA. An output with which to take some energetic action in the environment. Information received is logically compared with memory to become “knowledge.” From the simplest organism to the most complex, knowledge is inseparable from the organism itself. Whether an organism possesses knowledge can only be determined by observing the organism in operation. For example, students are fed information and presumably learn, but the only way to know it has become knowledge is to test them. None of this is scientifically controversial. However, addition of the Constructal Law provides the basis for describing the use of energy by all life forms (organisms) to grow, evolve and/or reproduce. This is the Theory of Constructal Infonomics. All life forms must harvest energy from the environment to live. If one visualizes a free standing organism, a bacteria, a tree or a human, they can be looked at as a channel through which energy flows. Some of the passing energy is absorbed by the mechanisms which maintain the channel. First, they must provide power for their own operation. When this need is met, the organism is in equilibrium with itself. It is not dying, but it does not have enough energy resources (stored or immediate) to grow, evolve or reproduce. The constructal law states that all energetic flows will use their energy to morph or evolve their channel to increase access to their flows. The morphing and evolving of channels by energetic streams flowing through them is not random. It is determined by the laws of physics. It accounts for how solar systems evolve, the shape of river beds, the structure of trees, how lungs work, the architecture of blood and nervous systems, why animals are the size they are, the evolution of cities and much more. Professor Bejan has written extensively about this concept of universal evolution in his two books and many scientific papers. Applied to life forms, the Constructal Law means that organisms require surplus energy to grow, evolve or reproduce, thus allowing yet more energy to flow through their channels. But life forms are not just passive river beds. Life has intelligence. Life forms have the ability to direct flows of energy to themselves and amplify the energy they use for operation. This is the key to understanding the universal driver of all life forms. The success of any life form is its ability to maximize the amount of energy it can direct to its own growth, evolution and reproduction. In the Theory of Constructal Infonomics, I have defined the elemental unit of life as the “knowledge constructor.” It is the minimal mechanism that can be considered to have the properties required for life. It is based on the Turing architecture, with the thermodynamic elements made explicit. In this idealized example, the knowledge constructor is self sufficient. There is no limit to the size, number of sensors or actuators or complexity of processor that a knowledge constructor may possess. There is no limit to the method of operation of the knowledge constructor. There is no limit on the complexity of the hierarchies they may form by joining forces with other knowledge constructors. Knowledge is a fundamental property of life forms. The expression of knowledge is the activity of life. Knowledge is a property of the complete life form. You cannot extract knowledge except by its expression using the actuators available. This is the completeness theorem. Knowledge is the basis for the formation of hierarchy and dependency in complex life forms as described below. Intelligence is a dimension of knowledge, used to express relative capability to express knowledge. For example, a bacteria is more intelligent than a rock. At certain tasks, humans may be more intelligent than the bacteria. However, when it comes to detecting and neutralizing invading pathogens, the bacteria may be far more intelligent than its human owner, the “listen to your gut” meme. Many growth and evolution processes, especially reproduction, are complex and long term. Environmental energy supplies will almost certainly not be consistent enough to sustain such lengthy and complex processes. Therefore, virtually all life forms develop some means to store energy. These stores can be tapped when necessary to fuel the processes of growth, evolution or reproduction. The importance of energy storage as a function of life is evident at all levels, from the simplest to the human agricultural revolution to our modern transportation systems. In the real world, knowledge constructors are mostly found in dependent roles within larger enclosing organisms. Every cell in a person’s body is itself a knowledge constructor, as are many of the parts within the cellular hierarchy, for example mitochondria and the DNA machinery. They receive inputs from the environment, access knowledge from stored DNA resources and executes quite elaborate internal DNA-based computations. They then express their understanding of their function within the body in the way that will most benefit the growth, evolution and/or reproduction of the body they are part of. Complex organisms inevitably form hierarchies in order to maximize their potential. They form complex “enclosing” organisms out of individual living units. The mitochondria are “enclosed” in cells and all the cells in our bodies are “dependent” organisms for which we are the enclosing organism. While a cell within a body can’t feed itself independently, the other cells of the body are organized in a hierarchy of organs to bring it nutrients as required. For the person owning the body, the first priority is to keep its cells alive. Breathing is a must. Close behind comes water and food (some might argue wifi). The energy harvesting goals of a person are exactly the same as every one of its individual cells. In fact, the wifi quip isn’t just sarcastic. As we depend more and more on connections to harvest personal energy and build our wealth, we are indeed becoming physically dependent on our technology. Early on, organisms reproduced by simple splitting or budding, creating exact copies. This has its limitations, so eventually sexual reproduction evolved to speed up evolution, allowing more complex species to evolve. It has been a great success. However, a species cannot have only a male or female and survive. There is no assumption that sexual partners will be in immediate proximity of each other. They must communicate, use knowledge and cooperate in order to propagate the species. This gives rise to the concept of “extended” organisms. The pair constitute the extended organism. Their extended “enclosing” organism inherits all the characteristics of its members in terms of the need to harvest energy for survival.The sexual partners are dependent on each other for survival of the species. There are of course, many variations on this theme in biology. Groups and hierarchies naturally form to maximize the energy amplification of the species. Communication becomes more sophisticated. Schools of fish, flocks of birds, prides of lions and tribes of baboons all led the way to the emergence of humans. Evolution of the human brain represents the fist major step beyond DNA evolution. Humans learned to organize and plan. They learned to use the past and predict the future. They invented language music and dance as ways of storing information in groups of individual brains. Art, drawing, writing, sculpture and jewelry were all ways of storing and transmitting knowledge outside of the human body. In the process, all the human information technologies we use today evolved. Speech, music and art converged to create the technology of plays. A small group of actors could convey structured information to an arbitrary audience of viewers. We still practice this technology virtually unchanged today. To put all this in human perspective, let’s take a short detour to visit our distant cave person relative and see how he or she progressed in their ability to amplify energy based on information and knowledge. Ork, lives in a cave with no nearby source of food. A passing traveler tells him (Ork could certainly be a woman as well) that berries grow on yonder hillside. With that knowledge, it takes 2000 calories for Ork to walk to and from the hillside. When he gets there, the berries are not fully in season and he only finds ten, which provide him 500 calories of energy. If this is his only food supply, Ork will starve. By virtue of Ork’s knowledge of language, he has learned where the berries are located, how to fashion a bag to carry them and their future value as food. When the berries come into season, Ork harvests as many berries as he can carry. One trip might harvest 50,000 calories of food energy in return for his knowledgable investment of 2,000. Soon Ork has amassed a few hundred thousand calories of stored energy. He can now invest in searching for new sources of energy. If successful, he might increase his harvest by more multiples of his invested energy. Since Ork is now harvesting more energy than needed for bare survival, he grows. He invests some of his stored energy in learning new skills, evolving his brain power and increasing his ability to amplify energy. Instead of relying on browsing, he might learn to hunt. At some point, Ork discovers a suitable female and mates with her. She moves into his cave and working together, the two of them further amplify their mutual ability to harvest and store energy in order to support the new energy costs of reproduction. Soon Ork discovers that by cooperating with others, they can further amplify their energy supplies. Clans and tribes are born. Agriculture and the storage of food further enhances their energy supplies. Hierarchies of dependency emerge. Soon they discover that it is easier to gain energy by taking it away from others than developing the sources themselves. For all extended life forms, on average, the members of the group organism must receive greater energy in return for their efforts than they could working alone. Humans excel in forming group organisms, for example, clans, city states, nations, religions, companies and clubs. In a company life form, the workers are the dependent organisms, earning more working for the company than they could (or think they could) working alone. Their efforts allow the company to express its collective knowledge and produce products, which are sold for a profit. Some of the profit goes to the workers and the surplus is available to grow, evolve or reproduce the organization. A profitless organization may live but will stagnate. More profitable competitors will grow or evolve past it. The instant that the workers feel that they are not getting back as much as they put in, that their personal amplification factor is less than one, they are gone as well. How long would a company last if it demanded that the workers pay it for the privilege of say, packing chicken breasts. The presumed purpose of tribes and nation states is to provide returns to its citizens in excess of what the citizens are required to individually contribute. As soon as the perceived amplification factor reaches one or less, the seeds of revolution are planted. If a revolutionary organism forms and starts to amplify its own energy, it can enter positive feedback and grow like an explosion. Ironically, attempts to suppress revolution frequently have the unintended consequence of adding fuel to the fire. The revolutionaries always see great new energy coming to them. However, after the revolution, the same forces of physics and economics take hold that created the wealth inequality that was being rebelled against. From the perspective of the TCI, wars are simply outwardly directed revolutions. If we take over that country or exterminate that group of people, we will have more energy available to us. It is perhaps a sad commentary that the drive of all life forms to harvest the maximum possible amount of energy is responsible for the eternal shedding of human blood. Here is a brief example of using political groups and companies to understand the evolution of society using the concepts of the TCI. The organisms of tribes, nation states and companies all exist for the purpose of amplifying the energy available to their dependent members. 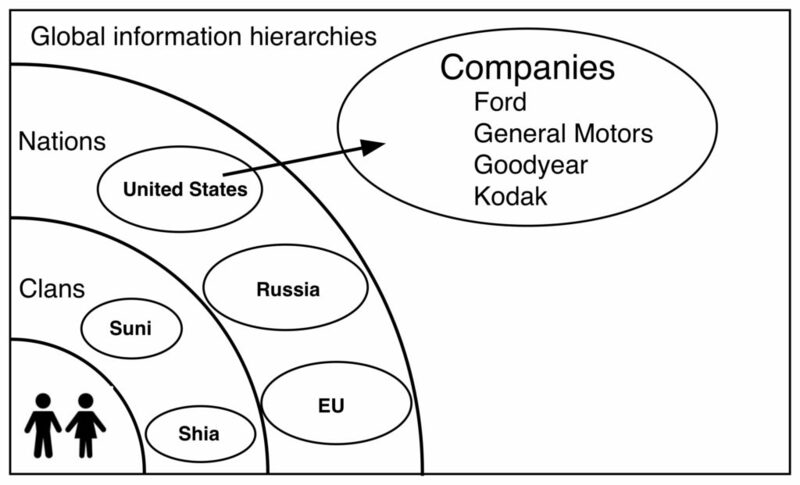 As nation states evolved during the early parts of the industrial revolution, companies evolved within them. Generally geographically based, they became co-amplifiers of personal wealth for the citizens of their country. Today, with the rise of the global information economy, amplification of personal energy has shifted away from the geographically limited countries and companies. The companies themselves have gone global and increasingly are dictating terms to national governments. 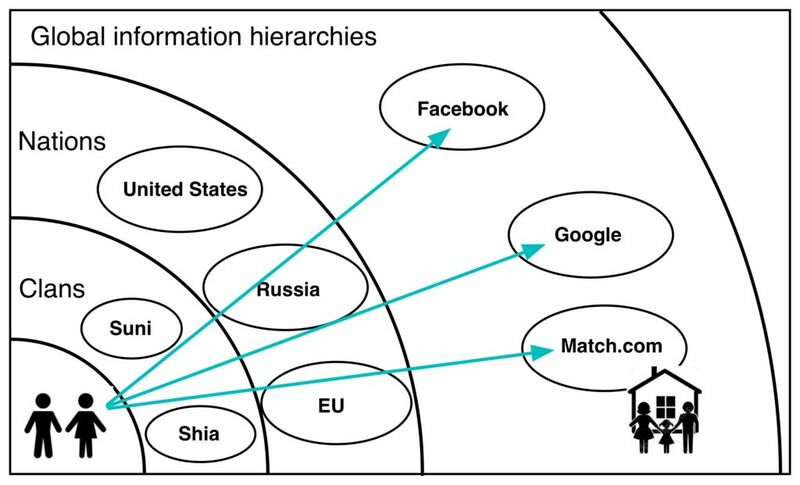 Likewise, workers and users have abandoned their old geographical roots and are joining global connectivist groups. This leaves the old nations holding the bag for maintaining services and infrastructure while their citizens and companies become less and less dependent. The fact that Apple has 90% of its income outside of the Unites States is a good indication that the old structures are breaking down. Whatever the political machinations behind his decision, President Trump’s instinct to open up the U.S. energy supplies is supported by the theory that any living organism needs excess energy in order to grow or evolve. A country with shrinking supply and/or more expensive energy will find itself in negative amplification and ripe for revolution. More optimistically, I believe the future of humanity will not be determined by bickering over ever-shrinking energy supplies. Instead, human resources will be directed to cooperative and competitive ventures and new organizational organisms that vastly expand the energy horizons available to humans on a global basis. Machines have co-evolved with humans since the invention of stone scrapers and knives. They have evolved from simple artifacts to tools to complex machines, some having knowledge embedded within them. Working in concert with us, machines are evolving as dependent life forms in our hierarchy of life. Soon they may be forming their own extended organisms and hierarchies. Just as animate life made the step from simple machines to biology with the evolution of DNA, machines could sooner or later make the same step. Either we will help them for our mutual benefit or they will force us to help them, driven by the need to harvest ever more energy. In ways that we are only beginning to understand, humanity it taking over control of DNA biology and embedding ever greater intelligence, knowledge and power into machines. There are many opinions about how the future will unfold. Predicting the future is a fundamental requirement for the success of life forms. The accuracy of our predictions will be enhanced by understanding the physical laws that drive the evolution of life and the entire universe. The Theory of Constructal Infonomics proves the commonality of all life forms. The one thing we know for sure about the future is that it will be driven by the incessant and implacable need of all life forms to harness ever more energy for growth, evolution and reproduction.